More-so than his weapons, a warriors hands were his tools, as they allowed him to deftly wield weapons against his foes in battle. These Medieval Gauntlets were designed to provide protection to a warriors hands, while leaving his dexterity intact. These gauntlets are made from various layers of steel, consisting of a steel cuff that wraps around the wrist that leads in to several interlocking steel plates that protect the back of the hand, as well as several more interlocking steel plates that protect each of the fingers, including the thumb. These gauntlets are fully articulated and are made using a glove underneath, which means that wearing the gauntlets is actually rather easy and comfortable. 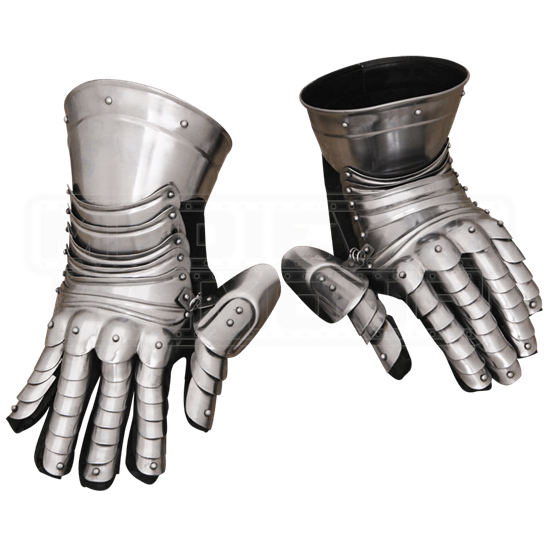 Very little is lost in the way of finger movement when wearing these gauntlets, which means that they do not impede in a warriors ability to grip, grab, or fight. They come in one size, as a matched pair. If you worry about keeping your hands fully protected when you go into battle, then you need a good pair of Medieval Gauntlets just like these. And not only do they look good, but they are also quite fun to wear, too.